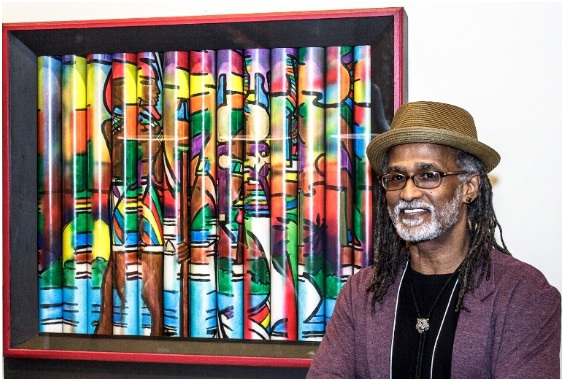 Guy Beckles is the only practicing kinetic artist in the English-speaking Caribbean. He hails from the sunny island of Trinidad renowned for its Carnival- masqueraders, costumes, and rhythm-kinetic art in its most colorful, intoxicating expression. In high school Beckles studied math and physics but it was while attending Dartmouth College, New Hampshire that “the love affair began”. In one course, the students were given a project to create a distorted cube…and his first kinetic piece was born. His love for physics prompted him to make art that moves and he applies a fundamental knowledge of gears, levers, pulleys, motors, magnetism, balance and the theory that to every action there is an equal and opposite reaction to his creations. As a new creation burgeons into life, Beckles uses all sensory stimuli and allows divine influence to shape the work. He surrounds himself with various materials and gadgets, allowing playful exploration to create thought provoking and sensory-stimulating art. 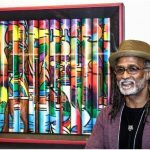 Upon graduation with a BA in Visual Studies, Beckles returned to Trinidad, taught high school art for several years and continued creating art. He currently focuses solely on his craft, which is also influenced by his extensive travels throughout North India, North Africa, Western China and Europe. He has exhibited in London, New York, Florida, Washington DC, Boston, Toronto and Trinidad. His work is often reflective of a society’s dynamics and social constructs – whimsical and profound, soothing yet disturbing. He hopes to evoke curiosity and amazement, where the viewer asks “How?” and “Why?”. Pat speaks about Guy Beckles . . .
“To walk into a room full of spinning, whirring, dancing and experience Guy Beckles’ mobile sculpture, is to return to the long forgotten magic of a fairground of childhood fantasy. The shapes and their colours have their own lives slicing through space, creating pattern uponpattern; shape upon shape, always magical and always beguiling. Art persons call this kind of sculpture KINETIC that is derived from a Greek word which means motion. So that this kind of art allows or enables material bodies and the forces and energy associated with them as they move, to move. And what bodies Guy Beckles builds!! Some of them are jokey, quirky and singular. But all of them are full of free colour, and none of them are still. Artist, Musician, Honorary Doctor of Philosophy from the University of the West Indies, Trinidad & Tobago. . . .Clearly his work is unique among Caribbean artists, but beyond that, what is it about? It is about the artist himself. My earliest impressions of Guy Beckles remain – that seriousness etched with a smile. He is whimsical, yet very profound. He is unfeignedly courteous, but always demanding the closest attention. As he is, so is his work. The seriousness is invariably etched with a mischievous chuckle and the smile can sometimes conceal despair. When the work so clearly reflects the spirit of the maker of the work, we are witnessing truth. The artist is revealing himself. He is telling his inherent truth . . . and this, is the best any artist can do…. Designer of the 1996 Olympic Ceremonies in Atlanta. Contributing designer of the 1999 Miss Universe Opening Ceremony in Trinidad & Tobago. Avant-Garde Conceptualist/Designer of some of the most innovative masquerade productions in the recent history of Trinidad & Tobago’s annual Carnival street-parade. To me, as a fellow practitioner, the artwork of Guy Beckles represents a process of investigation and experimentation, with the discarded components of toys and electrical appliances. These objects are usually associated with consumer society’s comforts and prowess. By re-configurating or re-animating these “items” the artist begins to alter our relationship to them. Consequently, they become, as raw material, subject to his own particular requirements as a creative individual. One can say that he has had his “way” with them. His discreet mischief becomes a symbol of our will and inventiveness. I often wonder if the placement of these moving artworks inside of glass cases contains and highlights or isolates these art actions in our traditional art space. The work can then be perceived as a metaphor for our anxiety as artists working within the confines of the slowly receding convention-bound arena of expectations, better known, thus far, as “the local art market”. The significance of this work is not to be derived exclusively from the immediate an obvious entertainment value of its “movements”, in space or by the artist’s natural inclination toward reflecting upon our social environment. After all, shouldn’t formal and methodological restlessness combined with concern with one’s word be a given? Aren’t these the expectations that make some calypsonians significant to us and others as digestable as they are forgettable? Significance may then be derived from the spirit of adventure that drives this artist to work in a manner that does not deny the dynamics of our cultural and historical location. The critical/visual challenges presented by Guy Beckles’ recent body of work cannot be engaged by mere reference to its constructivist antecedents. A desire to move from the illusionistic into the literal …. to explore/conquer the time/space continuum, is only one (minor) pre-occupation. Unlike some of his earlier pieces of ambiguous geographical/cultural origin, these works admit to and articulate, a specifically Caribbean-Trinidadian physical/psychological landscape. Rather then dwelling primarily on cerebral/esoteric “formal factors’, the kinetic conventions of Gabo and Duchamps together with Vasarely’s non-representational Op Art dicta become the vehicles for confronting the constants with which his island people, children of a hybrid Diaspora, negotiate. A Beckles assemblage/environment is a microcosm of society – his “visual vernacular” recalls, defines and questions the mental and physical space which he inhabits – a valid contribution an emerging New Caribbean iconography.